This week, first results from the Kepler mission are coming out in waves from the meeting of the American Astronomical Society (AAS) in Washington, DC. Carried along on those waves are papers on waves in stars. I’m referring to a branch of astronomy you’ll be hearing more about as Kepler and other missions begin to reveal the interior structures of stars- asteroseismology. So, what is asteroseismology? Seismology is the study of earthquakes on Earth. But more importantly to our discussion, it is the study of seismic waves. Earthquakes produce different types of seismic waves that travel through different layers of rock, and providing us with a way to image structures deep within the Earth. Essentially, large earthquakes provide us with a natural sonogram to look inside the Earth, far deeper then we can tunnel or drill. Since these waves propagate all the way from one side of the planet to the other we can look all the way to the center of the Earth. This is how we know the outer core of the Earth is liquid, and the relative dimensions and densities of the other parts of the Earth’s internal and surface structure. Asteroseismology, also known as stellar seismology, gives us the same kind of insight into the structure of stars. By studying the oscillations in pulsating stars, astronomers can peer into the very hearts of stars, one of the most difficult places to observe in the entire universe. The reason stellar interiors can be probed from oscillations is that different oscillation modes penetrate to different depths inside the star. Combining the rate, and amplitude of pulsation with other information, such as spectra, which reveals what the composition of the star is we obtain information on the internal structure of stars. Stellar oscillation modes are divided into three categories, based on the force that drives them: acoustic, gravity, and surface-gravity wave modes. p-mode, or acoustic waves, have pressure as their force, hence the name "p-mode". These waves can tell us things about the structure and density of regions below the surface of a star. g-mode, or gravity waves, are confined to the interior of the star. f-mode, or surface gravity waves are also gravity waves, but occur at or near the outer layers of stars, so they give us information about the surface conditions of stars. Helioseismology is the study of the propagation of wave oscillations in the Sun. Since the Sun is the closest star to us, it is much easier to study its pulsations in greater detail. By interpreting solar oscillations we can even detect sunspots on the far side of the Sun before they rotate into view. Many of our models of stellar interiors are based on information gained through studying the Sun’s oscillations. But the Sun is only one star at one point in its evolution, so to really understand stars we need to observe many more stars of different size, mass, composition and age. That is precisely what Kepler is doing right now. The satellite is staring at a 100 square degree section of the sky between Cygnus and Lyra continuously taking data on the brightness of over 150,000 stars for the next three to five years. 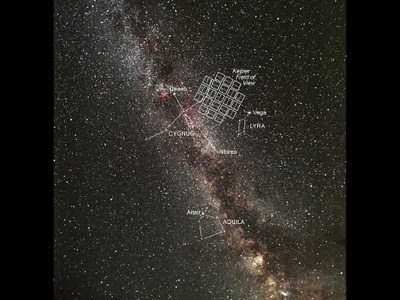 While Kepler’s primary mission is to discover the existence and abundance of earth-like planets around stars, all this high precision photometry will be used for other science, especially studying variable stars of all types and performing asteroseismology on stars showing solar-like oscillations. The much-anticipated release of the first science results from the Kepler mission January 4th included numerous papers on asteroseismology and the potential for understanding stellar structure in unprecedented detail. Astronomers are riding the new wave of information on wave propagation in stars. Surf’s up!